Artwork: Selected by Robert Jordan himself out of submissions received from Wheel of Time enthusiasts, the twelve pieces of art included in this calendar symbolize the devotion that readers have to Robert Jordan and to the rich world he created. Since its debut in 1990, Robert Jordan’s beloved Wheel of Time® series has become an international phenomenon topping bestseller lists all over the globe. With well over fifteen million books in print, readers have been enjoying Jordan’s lush storytelling for nearly twenty years. 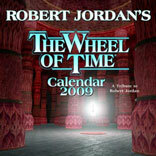 This calendar is a new way for fans to experience their favorite stories and characters and will be a must-have for Robert Jordan’s millions of fans.